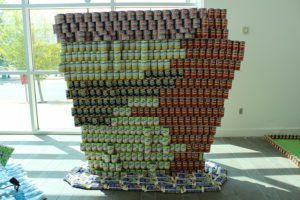 Food Drives are a great way to partner with the Arkansas Foodbank in helping us be a community that is united to fight hunger. We have a list of our most needed items that are available on our website or by contacting Nick Bradford. Get your Food Drive registered with the Foodbank by calling Nick Bradford. Get supplies you’ll need from the Foodbank. We have boxes, collection barrels and large totes. Tell people about your Food Drive on Social Media. Send out emails to co-workers, family and friends. Make flyers to put on your collection boxes or barrels. For every $1 donated to the Foodbank, we can provide food for 5 meals. You can do a virtual Food Drive set up by the Foodbank with your very own donation page to share with your friends and family. Just contact Nick Bradford to get this set up. You can create a Facebook Fundraiser for the Foodbank in conjunction with your food drive. Food pickup becomes cost prohibitive when we schedule small pickups. Only Food Drives over 500 pounds (or 500 cans of food) will be picked up by the Foodbank. To drop off your Food Drive, simply contact Nick Bradford to set up a delivery time. Our Warehouse is open for deliveries from 8:00 am – 12:00 pm and 1:00 pm-3:30 pm Monday – Friday. Our Warehouse staff will assist you in unloading your Food Drive once you arrive. If you are interested in hosting a Food & Fund drive, please complete this form or contact Nick Bradford 501.569.4315.